We are excited to share with everyone a recent well cut and documented profile of Outdoor Project, done by Portland's Pro Photo Supply, an Outdoor Project partner. They were eager to highlight how Outdoor Project is a movement, meeting the need to get people outdoors, to protect our natural heritage and promote environmental education with the creation of OutdoorProject.org, and to tell the story of Outdoor Project's contributor model as a way to share more beautiful, engaging, reliable and comprehensive adventure content. As I said in the video, we want to make heroes of our contributors. We especially loved hearing Hal tell how becoming a contributor has been a transformative experience for his photography and helped him explore more and go further. Our goal is that all of our contributors can have a similar experience with Outdoor Project and that their work continues to inspire all of us to get outside. 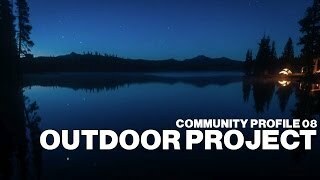 In an effort to showcase organization and individuals making a lasting impact in Oregon, especially people whose livelihood depends on quality photography and videography, Pro Photo Supply has compiled a series of short Community Profiles, including individuals such as Sean Stevens of Oregon Wild, Ian McCluskey of NW Documentary, and organizations such as Friends of Outdoor School and Ascending the Giants. We want to extend a huge thanks to Pro Photo Supply for including Outdoor Project in a great group of other local organizations worth profiling. See below for links to some of the adventures shown in the video, and enjoy!